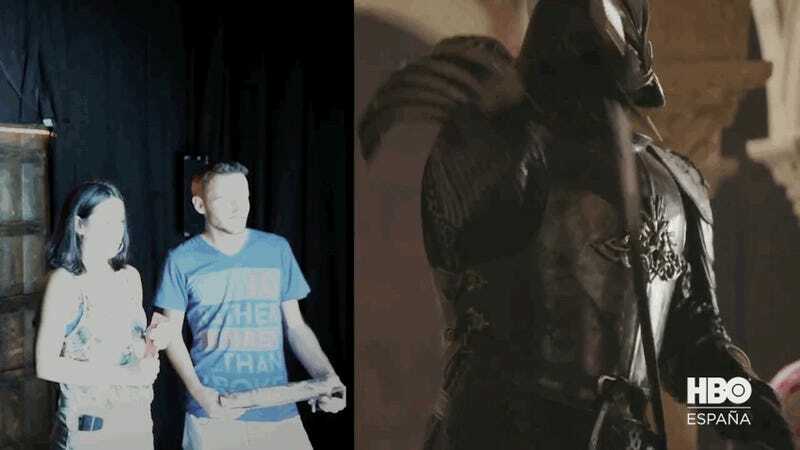 HBO Spain’s been hiding the latest peek at season seven of Game of Thrones inside a exhibit in Madrid, and they recently gave the public an inside glimpse at what a lucky few already knew: before winter even arrives, you can expect to see a hell of a lot of carnage. The video mostly focused on the three big battles of the season—at least the ones that we know about so far. 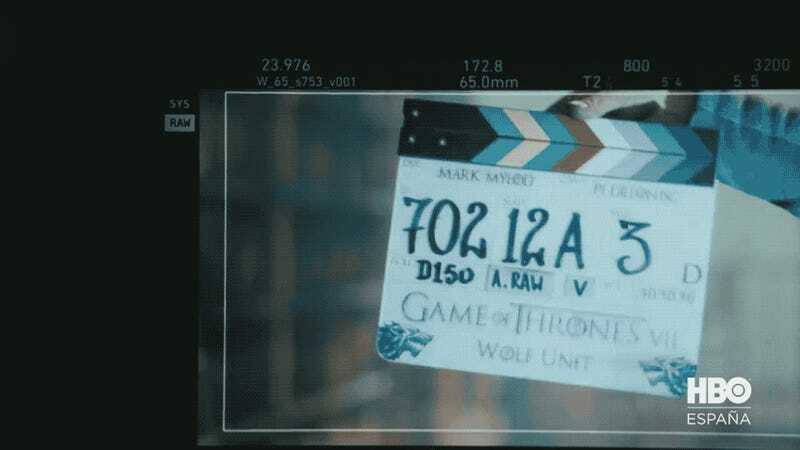 First, we’ve got the Unsullied and Lannister forces fighting in a battle we’ve seen in previous footage. The belief is they’re battling at Casterly Rock, the Lannister seat of power, which is making its small-screen debut this season. 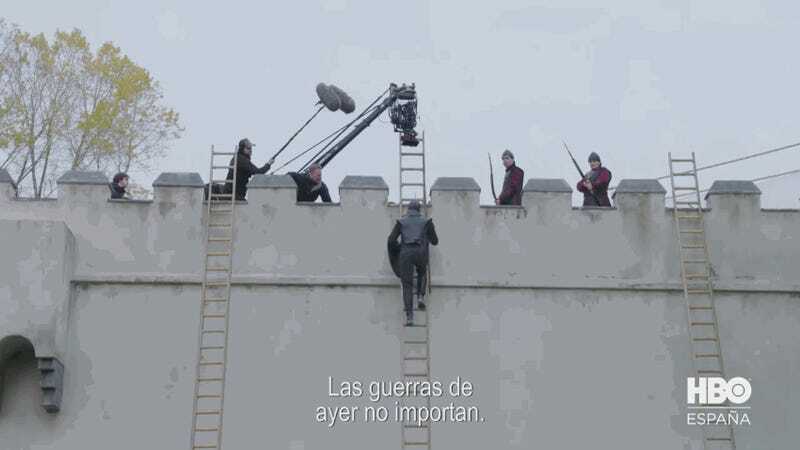 This would explain the ladders, as Casterly’s walls are supposed to be impenetrable. However, considering Casterly Rock is on the opposite end of Westeros from Dragonstone, the Unsullied might be part of Dany’s plan to retake Highgarden from the Lannisters, who are expected to conquer the Tyrell home next season. That totally looks like it says “Olenna’s Carriage”... or possibly Oleena, but that could easily be a behind-the-scenes typo. Whoops! 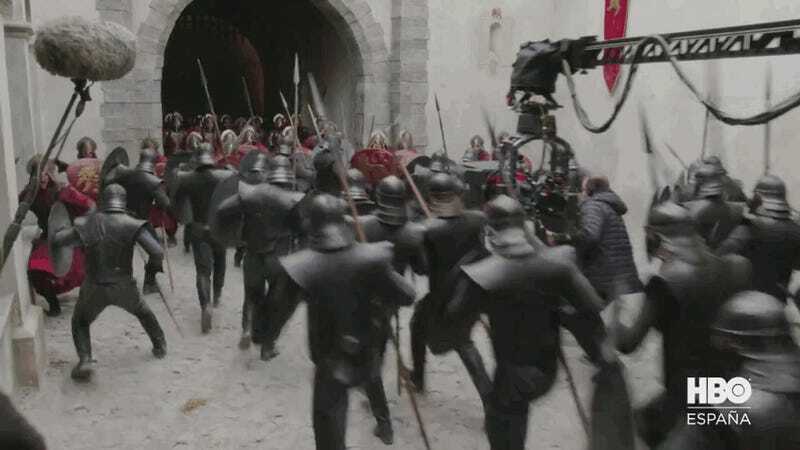 Next, there’s the Lannister battle against Daenerys and her forces around Highgarden, expected to be part of a land-and-sea skirmish that involves the Dothraki, Greyjoys, and everybody else who’s around at the time. The fire looks remarkably like something a dragon would make, making me super-duper hope that Dany shows up riding Drogon into battle. 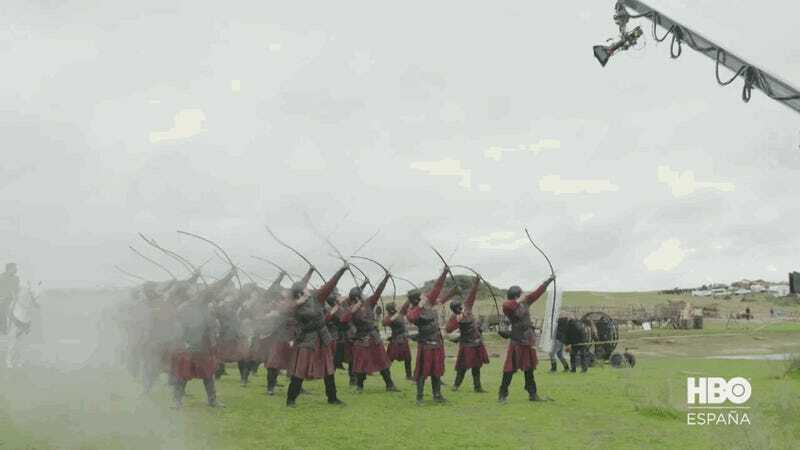 Plus, if you look on the left-hand side during the arrow shot, you can see Jaime Lannister chilling on his horse, leading the troops... further showing that he’ll be involved in this crucial battle. Here he is again, during a particularly blurry shot, yelling at a crowd of dragon fire fodder. 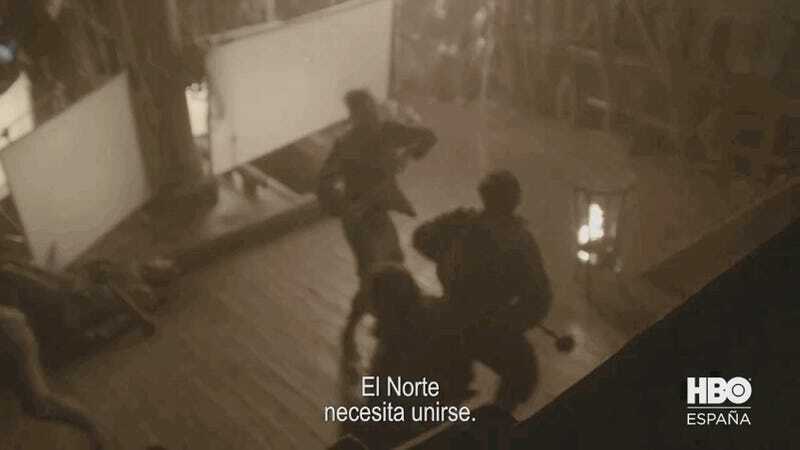 Here we’ve got another look at the sea part of the land-and-sea battle, showing Yara and Theon fighting a couple Iron Islanders— in fact, one of them might be Euron himself, the guy on the right fighting Theon. 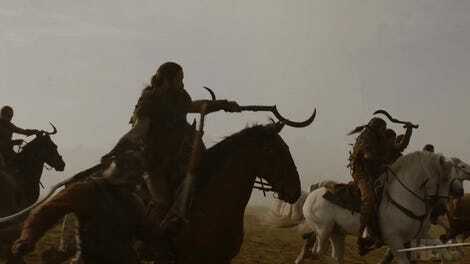 It’s great to see Yara in action again, as we haven’t really seen her do any major combat since she tried to free Theon (Reek) from Ramsay’s clutches. And her team didn’t really fare well in that fight. 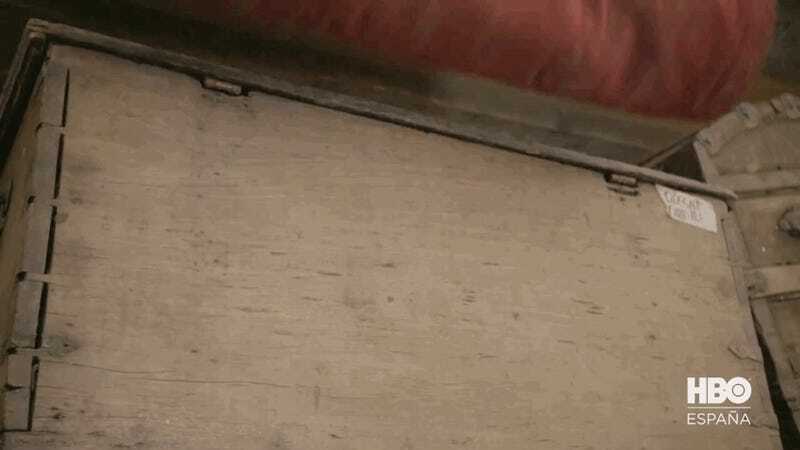 So here are a few non-battle snippets that also piqued our interest in this latest sneak peek. We’ve got a previously unseen maester at the Citadel. It’s far too blurry to see his face, but I’m hoping this could be Jim Broadbent, who’s playing an archmaester next season. 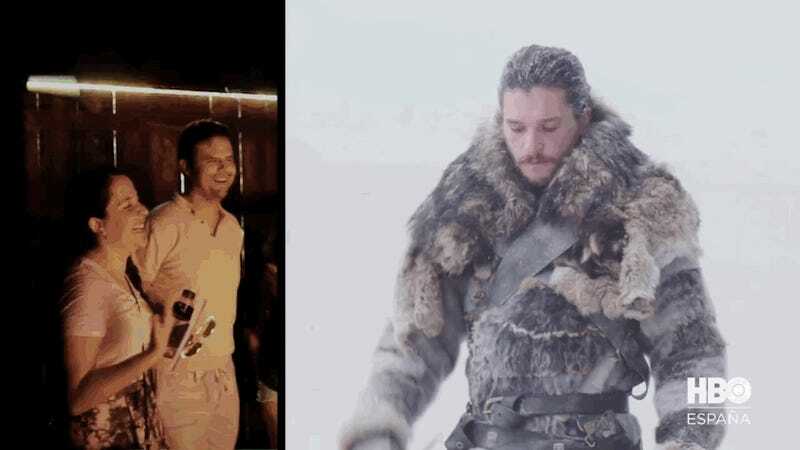 We’ve got Jon Snow doing a bit of swordplay with Longclaw in a super wintry area. This could mean he’s north of The Wall, preparing to take on the White Walkers, or that winter has started increasing its presence further south. I especially like how he’s got another sword chilling in his scabbard. Why have one sword when you can have two? Dany is exploring a cave at what looks to be Dragonstone. 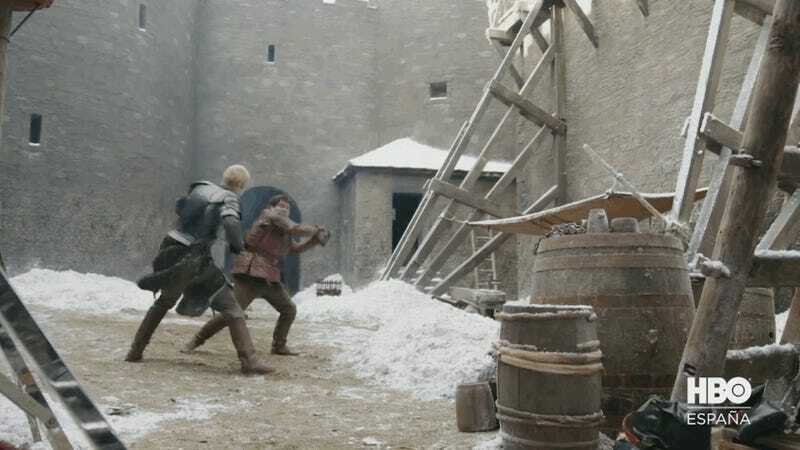 Brienne is teaching Pod how to fight! And... he doesn’t quite have the grasp yet. The Mountain will fight. Let me repeat: The. Mountain. Will. Fight. You can watch the entire video below while waiting for winter (and Game of Thrones) to finally get here on July 16.